Funerals have been held for a police inspector, his wife and daughter who were found dead at the family home in Leicestershire. Toby Day, 37, is thought to have stabbed wife Samantha and six-year-old daughter Genevieve before killing himself at their Melton Mowbray home. 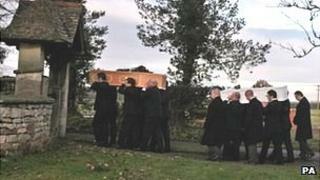 The three were laid to rest at the church in Rutland where the couple were married and their children baptised. The service was attended by family and friends. The couple's two older children, who were injured in the attack on 8 December, were expected to attend. The Rev Canon Lee Francis-Dehqani led the service in Market Overton while the address was given by the Rev Hildred Crowther. Canon Francis-Dehqani said: "The service was obviously a very difficult one. "It's not easy to come to this village church which saw Toby and Sam's wedding and the christening of all the children. "It's a very poignant and moving occasion but I did sense that the family are well supported and the Christian faith is very meaningful to them," he said. Police launched a murder inquiry following the incident, which came days after Mr Day was sacked from Leicestershire Police for misconduct, but said they were not looking for anyone else in connection with the deaths. The case was referred to the Independent Police Complaints Commission but it later said a formal investigation would not be carried out. An inquest into the deaths was opened and adjourned last month at Loughborough Coroner's Court, pending further inquiries.